Back in my anxious, overly zealous evangelical days, I had this habit of telling people horrible things or insulting them all for the sake of the Gospel and being “loving.’ I told them that I was saying these things for their own good—the ends had to justify the means. I reasoned that they were on the brink of eternal destruction, so any means of getting the message to them had to not only be justified but loving. This was just sharing the truth in love, right? This is a common problem: people hear unloving things from Christians and then Christians assure them, no, this is actually the most loving thing I could do. No wonder so many people thought I was crazy back then. In truth, I was living in a delusion. I’ve found that I don’t get to tell someone how to receive love or an insult. Evangelical Christians struggle to understand that good intentions do not make up for a smug or dismissive tone, hateful words, or damaging actions. We can discuss the merits of “tough love” in some situations and we all need some boundaries in extreme situations, but in our day to day interactions, some evangelicals say genuinely hurtful if not hateful things. Even just sharing a perspective that isn’t particularly hateful can be done in an angry, belligerent, or dismissive manner. I regularly receive emails from and read articles by Christians who take great umbrage at my support for women in ministry, and their typically mix their rage with just enough condescension to make their words sting. When such Christians are accused of being hurtful or hateful, they either claim they’re misunderstood or bemoan persecution and our “politically correct” culture. Aha! Checkmate, no? Well, not so fast… This is the kind of reasoning we use to stop someone in the midst of a split second, life and death scenario. This isn’t necessarily how we help someone start a relationship—which was the other thing I would have told you quite emphatically about Christianity. I would have gone to the mat to argue that Christianity is a relationship, not a “religion.” And yet, I used extremely pushy and impersonal means to start that relationship. If this is a relationship with God and we’re speaking to other adults about it, we can’t adopt a scorched earth policy that attempts to make them have a relationship with God AT ALL COSTS. Actually, we can do this and enjoy some success… with children. In my seminary class on evangelism (I’ll pause here so you can roll your eyes that I took an actual “class” on evangelism), we learned that high school and college students are the most important years to share the gospel. These are the years that we make our life-changing decisions that can alter the courses of our lives. To a certain extent, this is true. That’s why brands send free stuff to college students. For instance, the Bic razor handle I received for free in the mail is still in our medicine cabinet because I use it every morning. As one of the many evangelicals who is now repenting of my scorched earth evangelism that was trying to get people saved no matter what, I can now recognize the cognitive dissonance of my message. If I tried to share about God’s love through guilt, judgment, shame, or fear, I was only sharing my own guilt, judgment, shame, and fear. People were actually learning nothing about God from me. I was using the devil’s own tools in order to shove people toward a loving God who absorbed our anger and insults rather than dishing them out. Even more disturbing, I see cognitive dissonance all over evangelical Christianity today. When pastors teach against women in ministry or mutuality in marriage, they assure us that these limitations and restrictions actually free women to serve… in a much smaller sphere. When I receive angry, insulting, or dismissive emails because I hold the “unbiblical” view that women should, in fact, preach and serve as pastors, the senders completely miss the fact that Paul noted his words are a clanging cymbal without love. As church leaders overstep their authority through far-reaching covenants with their members that hand over enormous power to the leadership hierarchy, they assure us, no, we’re actually just caring for people. While unraveling my false conceptions of God, love, and Christian community, this cognitive dissonance has been the hardest thing to untangle. On the one hand, our faith does appear to have these dissonances wrapped up in it. There is liberty in discipline and the practices that help us remain connected with Christ, our vine, help us to receive God’s gift that we could still never earn. The more we surrender to God, the more freedom we will enjoy. The more we give up fleeting earthly indulgences, the greater chance we have to find the abundance of God. Speaking the truth is not automatically loving, and that has been a hard lesson to learn. We can only communicate the truth in love if we actually speak and act in ways that people recognize as loving. When people said I wasn’t acting very loving, it was on me to recognize that a message of love has to be communicated with genuine love and care as well. Am I actually loving someone when I talk about Jesus? The answer is as simple as the standard we use for telling a joke. If you have to explain it, then the answer is no. I’ll level with you. I’m a writer, not a book promoter. However, over the next two weeks, I’m going to be promoting my new book A Christian Survival Guide: A Lifeline to Faith and Growth. I loved writing this book. I’m working on loving the promotion of it. Every author tries to talk up their books without overwhelming friends and family with updates. So here’s the plan, my publisher and I have put together some different offers that will appeal to different groups. Each offer is about giving readers a chance to get the best deal possible on my writing, whether that’s just A Christian Survival Guide or it’s a bunch of books I’ve written. For instance, if you’re relatively new to my writing, this week you can pick up six eBooks for the price of one. Starting today, August 11th: Buy A Christian Survival Guide from my publisher, and you will receive a link to FIVE free eBooks at the end of the day that includes: the TWO full length Coffeehouse Theology Study Guides, Divided We Unite, Creating Space, and Why We Run from God’s Love. The offer ends Friday, August 15th. Not convinced? You can also read a two-chapter sample of the Survival Guide for free over at NoiseTrade books. 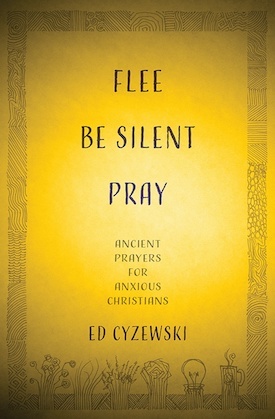 Get 5 FREE eBooks when you purchase A Christian Survival Guide by @edcyzewski at Kregel: http://ow.ly/zR9b1. And just a heads up, I have no idea about the precise time this offer expires on Friday the 15th (I assume by midnight EST). So don’t delay, but if you do hit any glitches, please drop a comment to let me know!